WARNING: This site contains photos and text depicting profane language, extreme violence, and death. This is the story of the Navy corpsmen and Marines of CAP 2-7-2 during the Vietnam War. Use the links at left for information about our CAP — and details of the unique counter-guerrilla war fought by the CAP Marines. 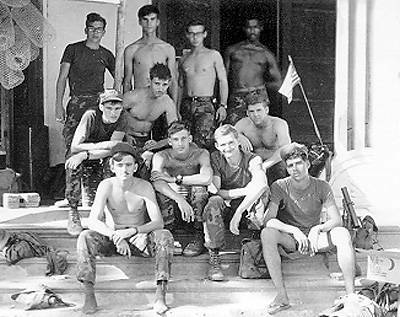 Members of CAP 2-7-2 in mid-1970 at a nicely built house we called the “Kitchen” in our main ville, Thanh Quit (1), just west of Highway 1, Dien Ban District, Quang Nam Province, Republic of Viet Nam. You can see a cluster of handmade bamboo fish traps at upper left, and a small American flag flying from the tape antenna of our PRC-25. An M-79 grenade launcher leans against the wall at right, just above an open case of C-rations. • Rick “Doc” Doggett, Wenatchee, Wash.
• Al “Zorro” Zarosinski, Keno, Ore.
• Charles H. “Willie” Williams, Opelousas, La. • Nelson Kilmister, Portsmouth, N.H.
• Dennis “Hucklebuck” Prock, Grovespring, Mo. • ____ Johnson, hometown unknown. • Ken “Dunc” Duncan, Crystal City, Mo. • Robert J. “R.J.” Carrier, Sterling Heights, Mich.
• Casey “Country” Roach, Rialto, Calif.
• ____ “Dizzy” Diaz, Brooklyn, N.Y.